This week again was something I wasn’t really planning or wanting to do, but I did. In the midst of planning our Elmo birthday party our cupcake lady extraordinaire came down with that pesky stomach flu that has been going around and was unable to do our cupcakes. So, me losing track of time didn’t get around to ordering from anywhere else and I decided to make them myself. So what right? Cupcakes. Hmmph! Well, I’m not a cook.. I’m not a baker, not a cupcake maker… I’ve made cupcakes before, and I’ve thrown birthday parties before, but I’ve never made cupcakes for a birthday party. 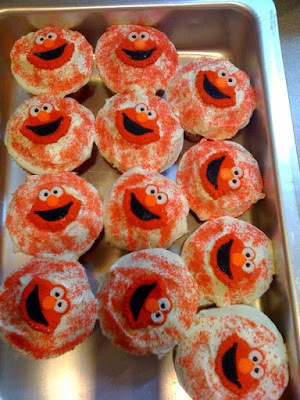 So I pulled myself up by the egg beaters and bought a couple of boxes of mix, I bought every single Elmo candy topper I could find and viola’ I made cupcakes for a birthday party. It’s been 3 days and there have been no reports of food poisoning. 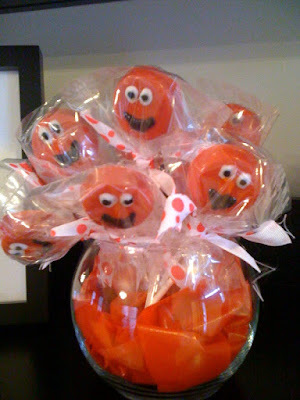 Those came out great- both the lollipops and the cupcakes!